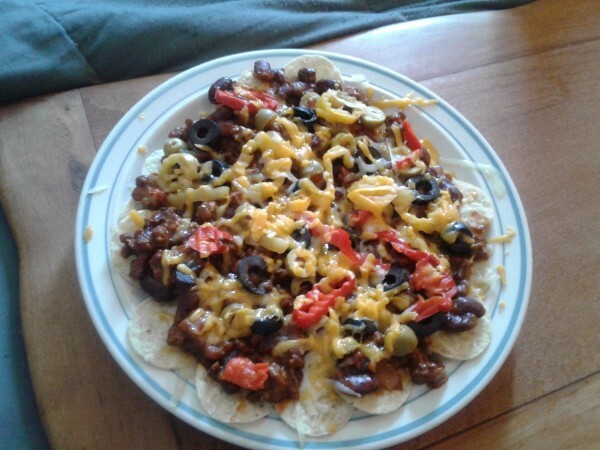 If you are looking for a quick and easy meal or snack, try out this chili cheddar nachos recipe. Delicious and hearty and sure to please. This recipe is quick and easy. It is great to serve as a snack at a get together or you can even as a main meal. You can add the toppings of your choice. Cook the onion and add the ground beef. Cook until done. Drain fat from ground beef. Open the large can of chili. Pour it in with the ground beef. Heat until warm. Spread the tortilla chips on a plate. Top with cheese. Add the chili mixture on top of the cheese. Top with your favorite toppings. I use black and green olives, and hot peppers. Top with more cheese. Microwave for 90 seconds.